As we near the end of LGBTQ history month, I thought I would reflect on my favorite gay comic book couples. Apollo and Midnighter: These two members of Stormwatch and the Authority are my favorites, at least before the new 52. When they didn’t belong to DC, their relationship and marriage were handled superbly. They adopted Jenny Quantum and made good dads, considering their line of work. The authors and artists did a good job of showing that while they were badasses when it came to fighting villains, they had love and affection for each other. It didn’t hurt that they were reflections on Batman and Superman as well. I’m behind on the new 52 versions, but the characters and their relationship got rebooted, so it seems a little watered down now. Northstar and Kyle: After skirting Alpha Flight member Northstar’s sexuality in one of the worst story lines ever (he’s not gay. 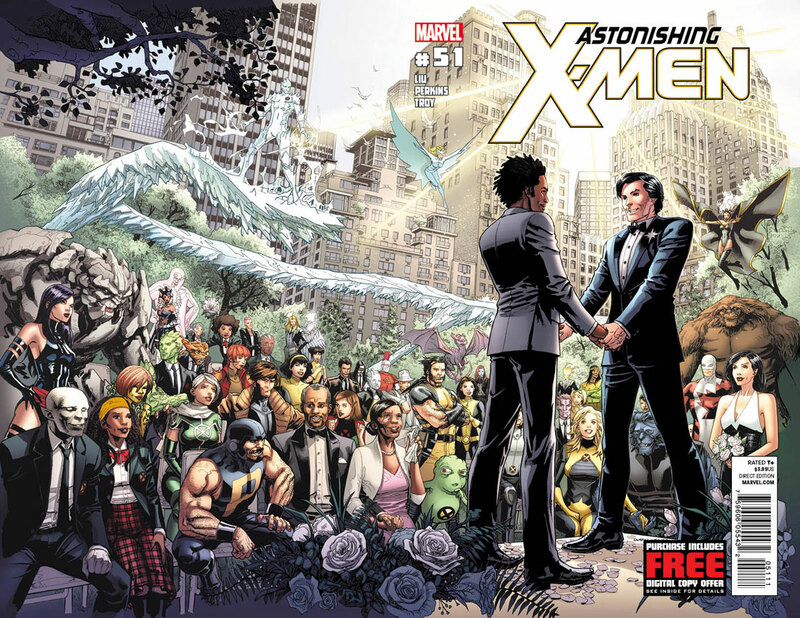 He’s a faery, literally), Marvel finally let the character “come out.” They even let him get married to his boyfriend Kyle. While still not a central character, it’s nice to see the married gay couple in the Marvel Universe. Rictor and Shatterstar: When these two got together in X-Factor, it was I think the first gay kiss in the Marvel Universe. The relationship had its rocky moments, as all do and those in comic books have even more. But they did stay together, at least until the series ended. I’m waiting to see if they come back again. I know there are other couples in comics, but these are my favorites (and I can’t afford to read everything out there!) Who are your favorites? ← That’s a fluffy bunny! Have you read Alan Moore’s Top Ten series? It’s a police story set in a city where everyone has superpowers. The police chief is a former WWII superhero called Jetboy (or something close). Shortly after the war’s end, he falls for an older Blackhawk-like character. It poses the question of why it’s okay to see a young character commit to adult situations in fighting the Nazis but not to commit to an adult relationship. It’s not entirely successful but the characters were good.